Want to Learn More About Your Catholic Faith? Have you been worshiping with us but never officially took the step to become Catholic? Were you baptized Catholic as a child but never received the other Sacraments of Initiation (Eucharist & Confirmation)? Have you been practicing another religion and would now like to find out more about the Catholic Church? Do you know family and friends who might be interested in learning about the Catholic Church? If any of the above questions apply to you, we would love to help you on your spiritual journey! Or, if you know of anyone who could answer YES to any of these questions, please extend them an invitation. 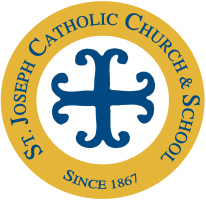 For more information on the RCIA process here at St. Joseph, please contact the Parish Office at 812-385-2617. RCIA is the Rite of Christian Initiation for Adults and is a gradual process, often called a journey of faith aimed at welcoming adults into our Catholic family through reflection on the experiences of their lives, the message of the Sacred Scripture and the teachings and doctrines of the Catholic Church. RCIA participants learn about the Catholic faith by understanding Catholic beliefs, and experiencing the Church's Liturgical Life over an appropriate period, and then are able to make a lasting commitment to the Catholic Church through the reception of the sacraments of Baptism, Confirmation, and Eucharist, ordinarily in a single liturgy during the Easter Vigil. Those who had already been baptized are received into full communion with the Catholic Church. How Does an Adult Become Catholic? RCIA is a gradual process which comprises four periods: Inquiry, Catechumenate, Purification & Enlightment, and Mystagogy. Participants never baptized and those already baptized journey together. Inquiry or Pre-Catechumenate Period: During this time, participants are encouraged to ask the questions on their minds and to explore the basic beliefs of the Catholic faith and to reflect on these in light of their own life experiences. Catechumenate Period: Catechumens (unbaptized) and Candidates ( already baptized) study Scripture, Doctrine, Traditions, and engage in St. Joseph's Community in service, meeting with the Community of Faith at weekly Mass and prayer. Purification & Enlightenment Period: During the Lenten Season (pre-Easter), those preparing for Baptism reflect upon their own faith experience in a more intense prayerful way. The baptized Candidates reflect more deeply on the meaning of their Baptism and celebrate the Sacrament of Reconciliation (confession). Mystagogy: During the fifty day Season of Easter, the new Catholics ponder the experience and meaning of the Sacraments and participate with the faithful in the Eucharistic life of the Church, deepening their grasp of the great Paschal Mystery in which they have just been incorporated. Formation and teaching continue to help them come into the full life of the community. Mystagogy is about mission. The new Christian, now part of Christ's Body, goes forth with us to continue the mission of Jesus Christ. Inquiry Sessions are held during September each year. RCIA Sessions take place from September - May each year. Weekly RCIA Sessions are on Tuesday evenings 6:30 - 8:15 p.m. in Parish Center Conference Room preceded by Mass at 6 p.m. Adults progressing through RCIA and the requisite Rites ordinarily will be received into the Church and receive the Sacraments of Baptism, Confirmation, and Eucharist at the Easter Vigil Mass. Individuals interested in the RCIA can obtain additional information by contacting Becky Sheridan, Spiritual Life Coordinator, at 812-385-2617. Click here for a schedule and list of RCIA topics.